The Wet Bulb Globe Temperature Risk map plots the current wet bulb globe temperature (degrees F) at the standard height of 1.5m (5 feet) along with its associated risk category. The wet bulb globe temperature is an estimation of the impact of temperature, humidity, wind speed, and solar radiation on humans. Its values are similar to a heat index; however, the wet bulb globe temperature additionally accounts for sunlight exposure and wind speed. 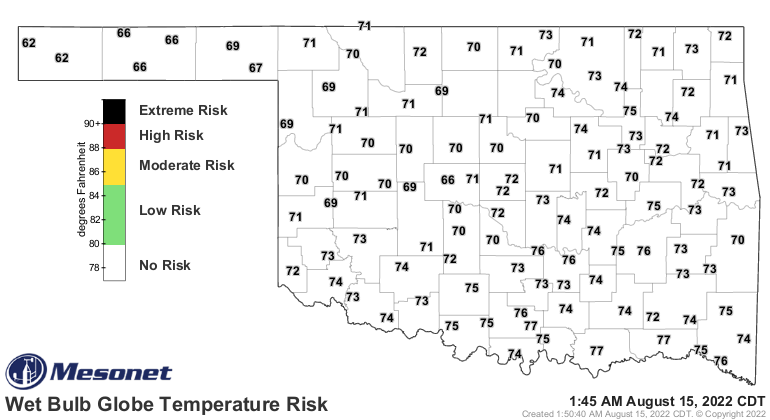 The risk categories are based on guidelines from the NWS Tulsa WFO. This map is updated every 5 minutes. For more information, please see our WBGT Category Work/Rest and Water Intake information handout.